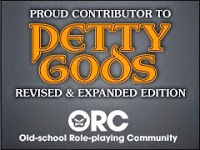 This week's Free GM Resource is a freebie from the about to die Tenkar's Tavern G+ Community. In case you didn't know, Google is killing the G+ platform, which is the reason the community would be "dying". I personally doubt these folks are going away....they just won't be using G+ anymore. 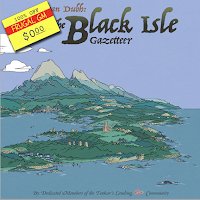 The Black Isle Gazetter is a 442 page crowd-sourced campaign setting. Sorry folks, but that is about as much as I can say about it right now. If you want the setting and a map, you cant post find the Dropbox link from this pertinent post over at Tenkar's Tavern. Sure I could post it here, but I've never been a fan of direct-linking someone else's work. I have downloaded the file and map, but haven't looked at them so I'm not able to speak as to the quality. Why? Well, I'm treating myself to a Lulu-printed copy and I want reading the softcover to be my 1st time reading the material. There is a link to the Lulu copy and even a coupon code over at that Tenkar's Tavern post.